Exclusive: The governing body have rejected Steven Craven's offer to resign over the fallout from his call to overrule a penalty given for Celtic in their match with Dundee United. The Scottish Football Association has rejected Steven Craven's attempt to resign. 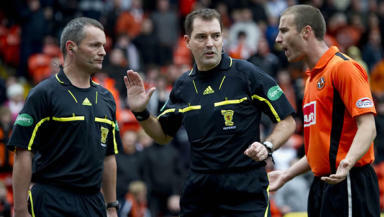 STV understands the official tendered his resignation after coming in for prolonged criticism for his involvement in a penalty decision for Celtic being overturned in their recent win at Dundee United. In the Tannadice fixture last Sunday, referee Dougie McDonald pointed to the spot after Gary Hooper appeared to be fouled in the box by United goalkeeper Dusan Pernis. McDonald then consulted with Craven over the decision, with the assistant referee convincing the referee to change his mind after informing him that he felt Pernis had played the ball. The decision left Celtic's players, management and supporters furious but, despite manager Neil Lennon receiving an explanation from McDonald after the match, the club are believed to have sent a letter to the SFA to seek further clarification on the matter. In the meantime, Craven tendered his resignation to the SFA on Friday, a move which was subsequently rejected. It is not known at this stage whether the category three specialist assistant referee will press ahead with his decision to quit regardless. Craven is due to take charge of an under-19s match between Rangers and Hibernian on Saturday morning at Murray Park, having stated he would fulfil his commitments this weekend before standing down. Referees chief Hugh Dallas defended the decision of Craven and McDonald to overturn the original decision earlier in the week, saying the pair had got it 100 per cent correct to change their minds. “I don’t understand what the big deal is," said Dallas. It’s not the first time this has happened. We had an incident at Kilmarnock just a few weeks ago when a decision was overturned. “The referee can overturn a decision, as long as he has not terminated or restarted the match. Referees get criticised for mistakes and I’m fine with that. We’re now in a situation where they’re getting criticised for making the right decisions. That’s the most frustrating thing. “People have got to understand a referee will make mistakes, but there was an opportunity to seek more information from the assistant. Dougie spoke discreetly to get the information from his assistant, who had a better angle. Looking at the replays you can see that decision was ultimately justified."